The most intense, violent and costly battle (in terms of human casualties as a percentage of combatants involved) in World War II--or in any war ever fought by Americans--was the conquest of Iwo Jima. That isolated, barren, sterile, sulfurous volcanic island, some 600 miles south of Tokyo, had value only as an airfield, either for Japanese fighters protecting the motherland from American bombers, or for American bombers seeking to force the surrender of the aggressor nation, the empire of Japan. Some 22,000 Japanese held this heavily-fortified island barely five and a half miles long at it greatest extent, occupying only 8 square miles, and having but one notable geographic feature: 550-foot high Mount Suribachi, an extinct volcano, at the southwest tip. 70,000 Marines and 800 Navy ships made the assault on this unavoidable obstacle to victory. Preparations for the invasion of Iwo had been under way for more than a year, and such extended preparation was scarcely adequate. Though the island was bombed for 72 consecutive days in December, 1944 and January, 1945, and the invasion was preceded by a naval bombardment that occupied the better part of three days, the Japanese defenses were scarcely touched. They had honey-combed the island with caves, trenches, and tunnels (the command center was 75 feet below the surface), and scarcely any targets were visible above ground. Only by a frontal assault on the entrenched enemy positions by infantry could the enemy be rooted out. This kind of attack is always the most costly in terms of lives (consider Pickett's charge on the third day at Gettysburg), but it could not be avoided. [Previous Island assaults had taught the Americans the hard lesson that the Japanese would fight to the last man to defend their positions. The massive bombardment was meant to smash the Japanese defensive positions and demoralize the defenders paving the way for an easy assault. As the invasion unfolded on the morning of February 15, the plan seemed a success. Huddled in their landing craft, the Marines encountered only scattered fire as they approached the beach. This situation didn't last long. Unbeknownst to the invaders, the Japanese had dug a labyrinth of tunnels and caves throughout the island that had protected them from the aerial bombardment. As the assault troops scrambled up the volcanic beach, the Japanese opened up with everything they had. It was a blood bath with the Marines pinned down by withering fire. The battle lasted thirty-six days, with the virtual extermination of the entire Japanese force--they collectively refused to surrender--and 25,851 American casualties, including nearly 7,000 dead. Of the Marines in this battle, Admiral Chester Nimitz, the commander of all American Naval forces in the Pacific, said, "Uncommon valour was a common virtue." And indeed it was. Of the eighty-four Medals of Honor awarded to Marines during all of World War II, twenty-seven (just short of one third) were awarded for heroism during the thirty-six days of fighting on Iwo Jima. It was during the fighting on Iwo Jima that a famous photograph was taken, indeed the most famous photo out of the millions taken during the war, in fact, the most famous photo ever taken anywhere at anytime: the raising of the American flag atop Mount Suribachi on the fourth day of the battle. Five Marines and one Navy corpsman are shown raising the Stars and Stripes as the flag unfurls in the ocean breeze. The photo was snapped as the pole was at a forty-five degree angle. This photo was immediately reproduced across the nation in countless newspapers, was emblazoned on hundreds of thousands, perhaps millions, of war-bond posters, was issued as a three-cent stamp (150 million copies were made), and served as the basis for the massive bronze Marine Corps Memorial near Arlington National Cemetery. It even graces the mousepad for my computer. James Bradley is the son of one of the flag-raisers on Suribachi, and in his book, Flags of Our Fathers, he tells the story of the six men--the oldest just 25, the youngest still in his teens--who were immortalized by this one photo. Bradley traces the steps, even from childhood, by which the six, from such diverse places as New Hampshire, Pennsylvania, eastern Kentucky, northern Wisconsin, south Texas, and Arizona, came together. All were part of Easy Company of the 2nd Battalion, 28th Regiment, 5th Marine Division. And to a man, they saw the raising of this particular flag as among the least significant things that occurred on Iwo. In reality, this was not the first flag-raising on Suribachi, but the second. On the morning of February 24, a group of 40 men were assigned to reconnoiter the upper slopes of the mountain. There were able to reach the top without resistance, and finding a length of pipe suitable as a standard, attached a modest-sized American flag they had brought with them to the pipe, and erected it. A roar of spontaneous cheers went up from all the Americans on the island, and the ships far at sea, viewing the event through field glasses, sounded their horns. This was not the flag-raising in the picture. The Secretary of the Navy, James Forrestal, in one of the ships off-shore, decided he wanted that flag as a souvenir. When 2nd Battalion commander Colonel Chandler Johnson heard this, he was enraged by this request and acted quickly to secure the flag as a souvenir for the battalion, whose men had put it up. He ordered the first flag replaced and secured--and a bigger one put in its place. (It just so happened that the second flag--8 feet by 4.5 feet--had been rescued from a sinking ship on December 7, 1941 at Pearl Harbor). This flag was hurried up the mountain, a second length of pipe (weighing over 100 lbs.) 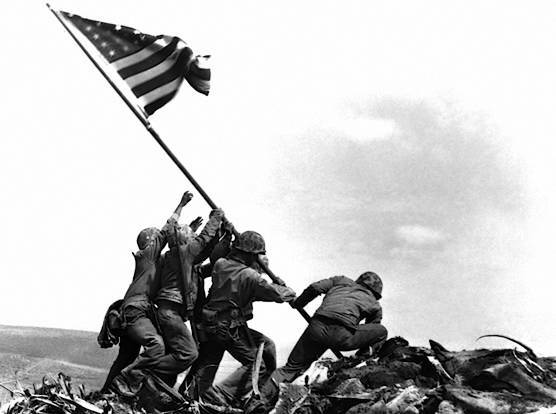 was located in the rubble, and as four marines struggled to raise it to take the place of the first flag, two others lent a helping hand, and the famous photo was taken by Joe Rosenthal, one of three photographers present. Joe was using a still camera and black and white film, as was a second man, who shot the simultaneous lowering of the first flag. A third cameraman took color motion pictures of the event. All was spontaneous and nothing about it was staged. Because this was merely a replacement flag, none of the six participants (who just happened to be there at the moment) gave their action a second thought. Indeed, it was only after the photo was published nation- and world-wide that the event was viewed with great interest. The participants were with some difficulty identified (one man was mis-identified for nearly two years)--three of them died before the battle for the island ended, and a fourth was seriously wounded. The surviving three were hurried back to the States, hailed as heroes, and used by the government to promote its Seventh War Bond Drive. The spotlight of fame and notoriety had a highly negative impact on all three survivors. They knew that this particular act for which they were lauded was of minuscule significance, though its symbolism is surpassingly great. The photo is symbolic of the courage, valor, honor, commitment and self-sacrifice of not just six men, but all 70,000 Marines who fought at Iwo Jima, and those who fought before and after at Guadalcanal, Tarawa, and Okinawa (and we might add, Korea, and Khe Sanh in Vietnam and a thousand other battlefields). As I read, my eyes filled with tears many times as I considered the sacrifice, suffering, pain, grief and sorrow endured by both the Marines and their families (perhaps the fact that one of my sons is a Marine was a contributing factor). Almost nothing sparks my ire--bordering on rage--more quickly and vehemently that seeing some mindless fool desecrate the American flag in "protest" of something he finds disagreeable about this country. No, it is not perfect, but to defile this flag is the grossest of abominations, and is an inexcusable insult to the bravery, courage and sacrifice of those who gave their last full measure of devotion to secure our freedoms from foreign tyranny. May we never forget. "Greater love hath no man than this, that a man lay down his life for his friends" (John 15:13). "Some would even dare to die" (Rom. 5:7).